I'm known for travelling near and far with a water bottle- full, empty, frozen, or ready for a refill. My kids know the routine, too, before stepping out of the front door, grab your water bottle. Drinking water is a daily ritual for my family, however, change is a good thing. Instead of sipping on my usual free fill of tap water, I enjoyed keeping hydrated with a chilled, trendy bottle of flavored, no-calorie energy water on a mission to "provide hydration with both function and flavor." Thank you to the team from Hydrive Energy Water for providing promotional product for editorial content purpose. I recently decided to upgrade my normal hydration game. Getting a little fancy, I switched up the regular water bottle for the new, reformulated Hydrive Energy Water. Bringing to the table the refreshing and revitalizing goodness of enhanced water, zero calories, B vitamins, and a natural caffeine boost, Hydrive Energy Water features four fruity flavors, Black Cherry, Blue Raspberry, Triple Berry and Citrus Burst, in a unique new light and refreshing formula minus the added sugar in other energy beverages. 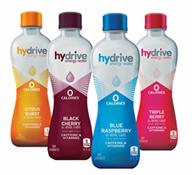 Hydrive Energy Water has recently reformulated their original energy water from 30 calories to 0 calories per 8 oz. serving. I'm in love with the slim, sleek design of the bottle, in addition to knowing that each 16 0z. bottle of Hydrive Energy Water has zero calories, 160 mg of caffeine and 35% DV of vitamins. Visit Hydrive Energy Water at HydriveEnergy.com and connect on Facebook and Twitter.